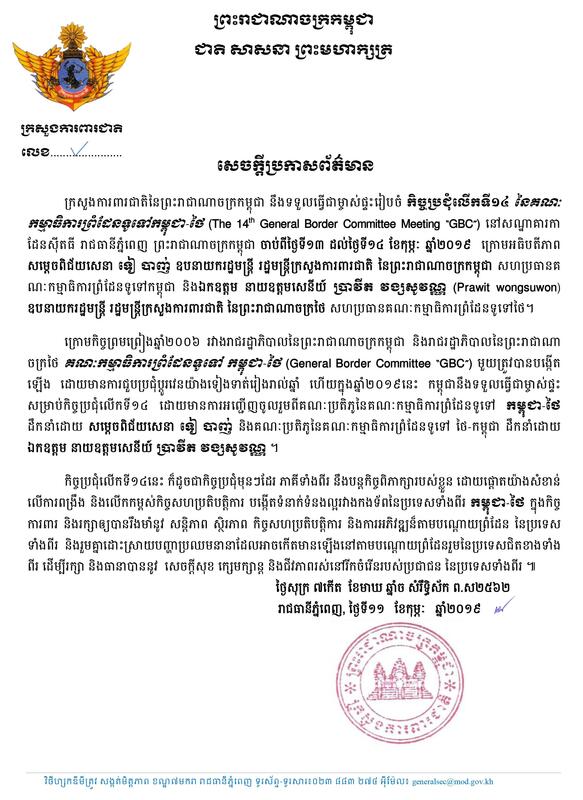 Phnom Penh (FN), Feb. 8 - The Ministry of National Defense will host the 14th Cambodian-Thai General Border Committee Meeting (GBC) at Garden City Hotel, Phnom Penh, from 13-14 February 2019, according to a press release dated Friday. The meeting will be presided over by Cambodian Minister of Defense Tea Banh and his counterpart Prawit Wongsuwon. The meeting will focus on strengthening and promoting cooperation between the two countries in safeguarding peace, stability, cooperation and development of Cambodia-Thailand border.